About 70% of the world's fragile states have seen conflict since 1989. A total of 1.5 billion people live in conflict-affected and fragile states. Since the pledge made by all United Nations member states to meet the so-called Millennium Development Goals (MDGs) by 2015, there has been an ongoing debate as to how to advance international development most effectively. The field incorporates a whole range of varying approaches, from Jeffrey Sachs' proposal to link financial aid to government performance to Dambisa Moyo's highly publicized dead aid theory. As the deadline for meeting the MDGs drew closer over the years, the international community established a second set of goals in order to push the aid effectiveness agenda. The 2011 Busan conference - officially known as the 4th High Level Forum on Aid Effectiveness - set out to establish clear principles on foreign aid. A particular focus was set on the world's more fragile states. 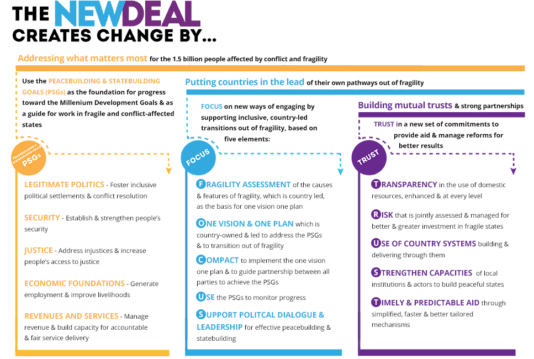 The "New Deal" for fragile states proposed an extended engagement with and increased development aid to these less stable parts of the world. Why this new deal, when the MDGs still feel so far out of reach? The New Deal for Peace is so important because these countries are likely to have the longest way to go as far as the MDGs are concerned. Therefore, it is crucial to give such fragile states the support they require in order to master a successful transition to stable and peaceful states. Today, on 19 April 2013, the third global meeting of the International Dialogue will be held in Washington DC. World Bank President Jim Kim, the president of USAID, and several high-ranking ministers of many G7+ countries will be among those attending the event. "Nineteen fragile states, including Afghanistan, Haiti, South Sudan and Timor-Leste are the nations farthest from reaching the Millennium Development Goals (MDGs). To define and advocate vital peace-building and state-building measures to stop conflict, build nations and end poverty, these nineteen states have recently come together as part of the g7+ group to rally for a common objective." "The first forum for political dialogue to bring together conflict-affected and fragile countries, international partners and civil society to catalyse successful transitions from conflict and fragility. This forum drives political momentum for change through strong partnership, innovation and mutual accountability for results. It provides support to the global voice of fragile states – such as the g7+ group of fragile states ­– and promotes solutions based on country-ownership and a comprehensive approach to development and security issues." Do you want to help shape the post-2015 global agenda? Share, tweet and put pressure on governments to put conflict and peacebuilding at the center of the post-MDG development agenda! Stay tuned on fairplanet to find out what happened at the International Dialogue's third meeting!